Contacts on your Android phone start to swell and become messy, so you hope there's an Android contact manager to help you do the tedious work? Or you have a lengthy contact list and want to import them to your new Android phone, say Samsung Galaxy S5? I bet you don't want to add contacts to your Android phone one by one manually. Also, losing all contacts on your Android phone is no fun. Therefore, backing up Android contacts before disaster strikes is a necessity. In these case scenarios, A powerful Android contact manager must be what you want. This contacts manager for Android empowers you to import or export contacts to/from Android phone easily. Import Android contacts: In the primary window, click Information, then click Contacts in the left sidebar to bring up the contact management window. Click Import > Import contacts from computer > from vCard file, from CSV file, from Outlook Express, from Outlook 2003/2007/2010/2013/2016, and from Windows Address Book. Export Android contacts: In the primary window, click Information, then click Contacts in the left sidebar. In the contact management window. Click Export > Export selected contacts to computer or Export all contacts to computer > to vCard file, to CSV file, to Outlook 2003/2007/2010/2013/2016 and to Windows Address Book. Find too many duplicate in your Anroid address book and account? Don't worry. 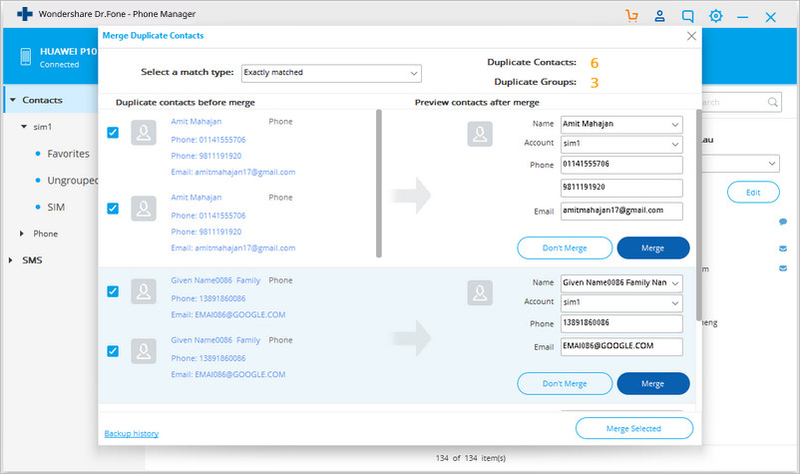 This Android contact manager software helps to find all duplicate contacts and merge them. Click Information>Contacts. The Android contact management options shows up in the top bar. Click Merge and check the accounts and your phone memory where your contacts are saved. Click Next. Select a match type and click Merge selected. Add contacts: In the contact management window, click + to add a new contact to your Android phone. Edit contacts: Double click the contact you want to edit and edit the information in the contact information window. Delete contacts: Select the contacts you want to remove, and then click Delete. If you want to import contacts to an existing account or group, just drag them to the corresponding category listed on the sidebar. Otherwise, right click to create a new group and then drag your wanted contacts into it. ExDialer - Dialer & Contacts is an easy-to-use Android contact manager app. It's mainly used to dial contacts conveniently. 1. Dial *: It will show the contacts you use frequently. 2. Dial #: Search any contact you want. 3. Long press the contacts icon located at the lower-left corner to get quick access to Favorites. Note: It's trial version. You can use it for free for 7 days. After that, you can buy the pro version. TouchPal Contacts is a smart dialer and contacts management Android app. 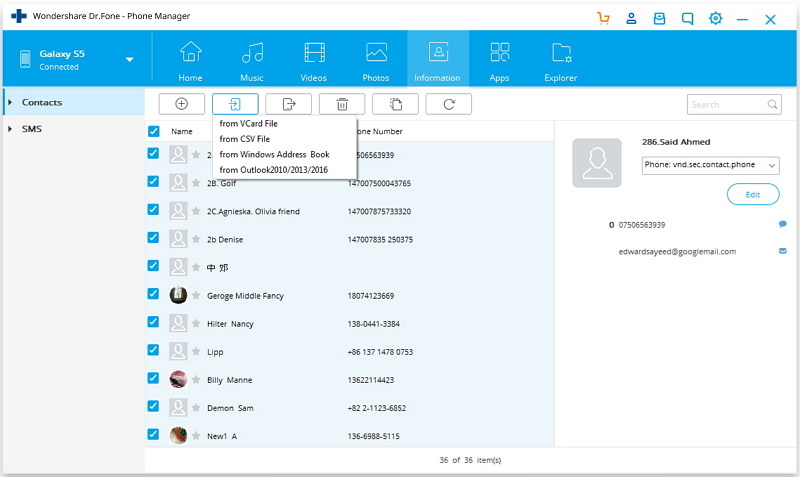 It allows you to search and find contacts by names, email, notes and address. It even lets you draw gesture to dial contacts you use frequently. Besides, it gives you the power to integrate Facebook and Twitter. DW Contacts & Phone & Dialer is a great Android address book management app for business. With it, you can search contacts, view contact info, write notes to call logs, share contacts via email or SMS and set ringtone. 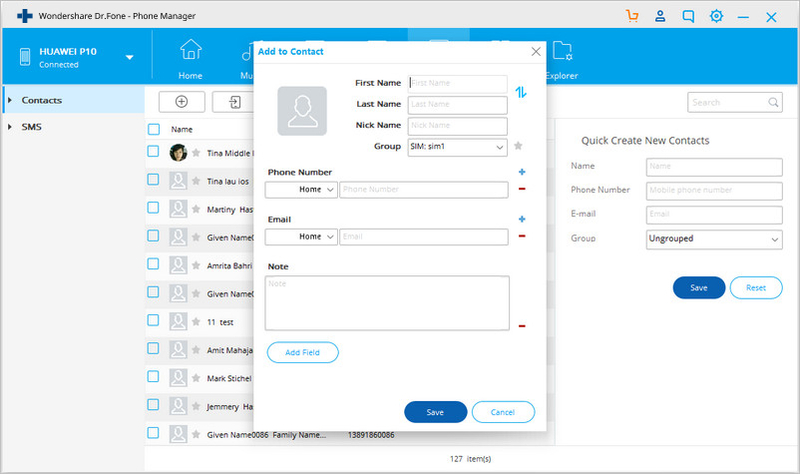 Other features offered by this app included backup contacts to vCard for restoring easily, Contact filtering by contact group, job title and company filtration contacts and more. Note: For more salient feature, you can buy its pro version. PixelPhone – Dialer & Contacts is an amazing address book app for Android. With it, you're able to quickly search and browse all contacts on your Android phone by using an ABC scroll bar, and sort contacts based on your owe usage habit – last name first or first name first. It supports smart T9 search through all fields in contacts and call history. As for the call history, you can sort it either by day or contacts, and you can set a time limit (3/7/14/28). There're other salient features, which you can experience when using it yourself. Note: It's a trial version with 7 days trial period. GO Contacts EX Black & Purple is a powerful contact management app for Android. It lets you search, merge, backup and group contacts seamlessly. 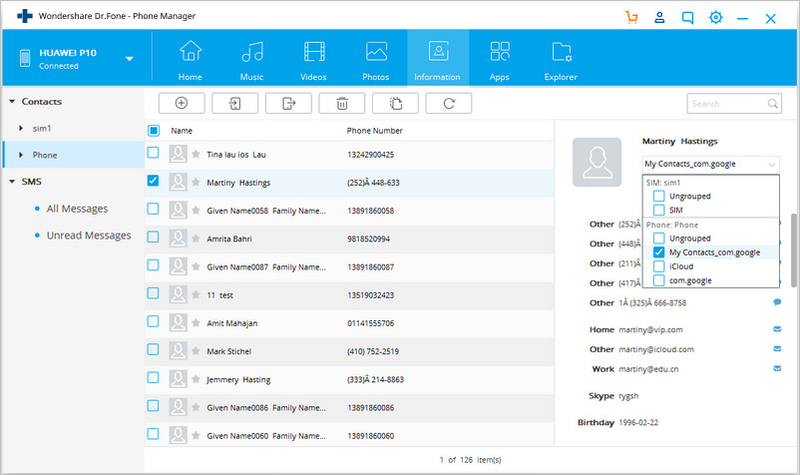 To be specific, it allows you to search and find your wanted contacts quickly, group contacts, merge contacts based on the phone number and name. What's more, it helps to backup your contacts to the SD card and restore when you're in need. It also offers you 3 kinds of themes (Dark, Spring and Ice Blue) to personalize your wanted style. Contacts + is an awesome Android app to manage contacts. It gives you the power to sync contacts with Whatsapp, Facebook, Twitter, Linkedin and Foursquare. Besides, you can use this app to merge duplicate contacts, send messages for free, view SMS threads, sync photos to Facebook and Google + automatically. To get more cool features, you can download this app and try it on your own. aContacts works greatly in contacts searching and sorting. It allows T9 search: England, German, Russian, Hebrew, Swedish, Romanian, Czech and Polish, and you can search contacts by company name or group. 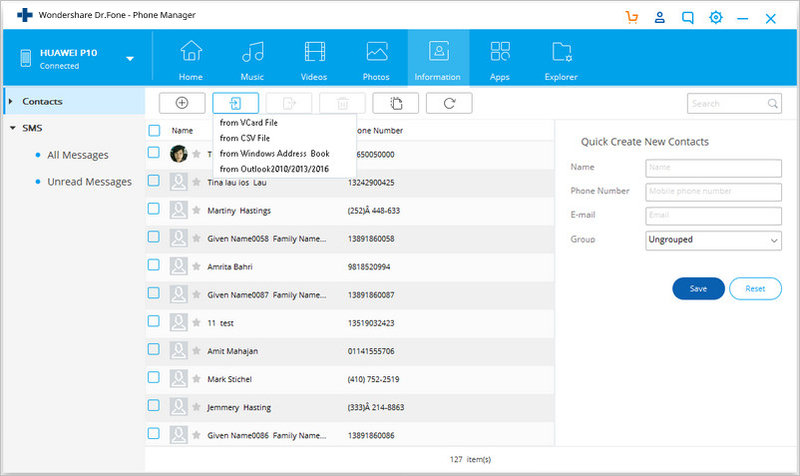 Others features include advance call logs, call back reminds, speed dial, etc. Want to know the best way you can recover your contacts from a Samsung Galaxy S7? Then this article is for you!